Thanks to our team of volunteers who staff the gallery, we are open to the public each week from Wednesday through Sunday from 10:00 a.m. to 4:00 p.m. except on certain holidays. 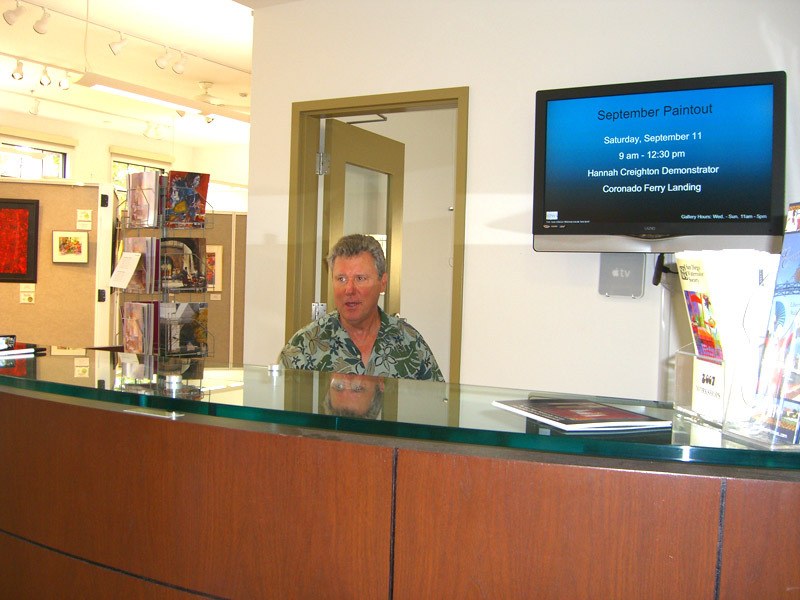 Our Gallery "Staffers" serve as SDWS ambassadors to visitors for two 3 hour shifts (10am – 1pm or 1pm – 4pm). They open/close the Gallery; greet and assist visitors, collect votes for our monthly People's Choice Award; check in/out books/videos; conduct sales and answer phones. They also sell paintings! It's always a thrill when one of our visitors wants to buy a painting, and thanks to our staffers, we are pleased to provide that service. This is a great way to meet other artits, learn about the "inner workings" of SDWS, and help us keep our gallery open. Please contact SDWS Volunteer Director, Gay Weston at (619) 876-4550 or at volunteerdirector@sdws.org for further details on how to get started.